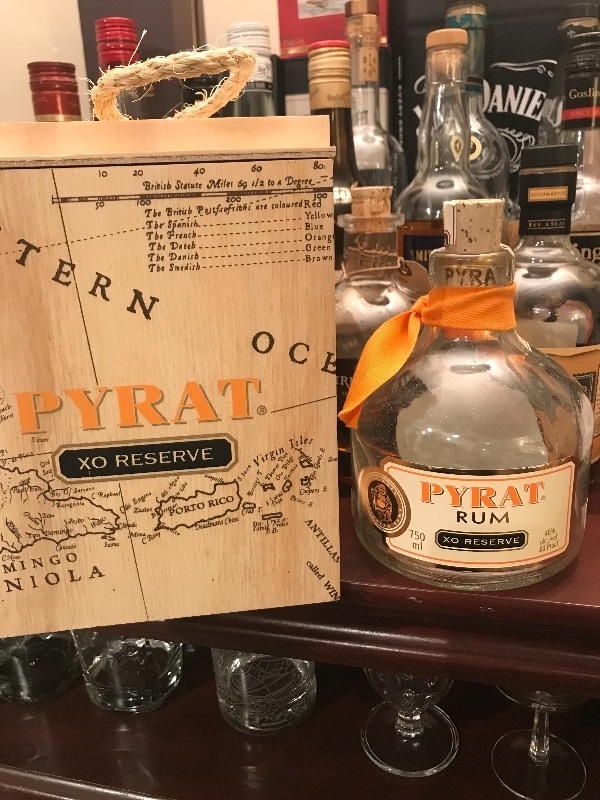 The Pyrat XO Reserva Rum tastes of vanilla, marzipan, sweet spice and ripe fruit and has a distinctive aroma, mostly a touch of orange peel or candied fruit. Its sweetness fits both with and without ice cubes and lemon slices, or in cocktails. This shoe didn´t fit. Thin taste with a lot of orange and alcohol. Bitter aftertaste. Po naliatí vôňa trochu umelá, plastová. Chuť zvláštna citrusovo alkoholová. S kockou ľadu a citrónom sa to moc nezlepšilo. No ku koncu kde bolo viac citrónu sa to ako otočilo. Skúsim dať tomu viac času. Ešte vsak to prehodnotím. Hmm... a lot of orange and actually more like a liqueur than rum. I was disappointed after trying this one. Straight out the bottle the stuff smells like you may have accidentally bought a bottle of Goo Gone. If you drink it right then, the stuff is nasty. Overly harsh and dominated by an almost tongue-numbing amount of orange additive. If you give up right then, though, you're doing yourself a disservice. Basically, the longer you let it rest, the more the alcoholic burn recedes, and the other flavors get some room to, erm, breathe. By the end of the bottle, what you have is a fun, toasty, and tropical drink lead by orange and charred oak, following through to a bit of hidden black cherry, all unified by that familiar throughline of golden syrup and toasted vanilla. All in all, while tasty, it's not quite a great or nuanced beverage, and while the orange is fun and different, even after letting the drink come to its senses it remains a bit too heavy, making it feel like a doctored rum with added orange liqueur. Essentially a perfect "6" on the Rum Ratings scale. So many better choices around. Worse as well. Just another sweetened rum. Drinkable, but not great. krásná láhev. chemická vůně. citrusy a vanilka. znovu už nekoupím. This is a decent aged rum. 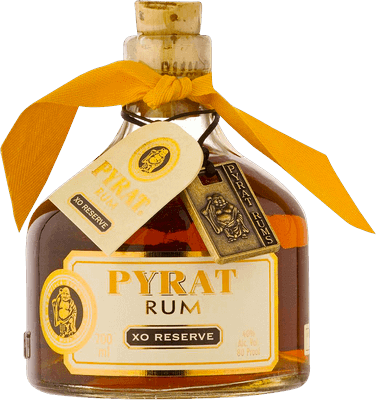 Pyrat has a nice aged rum taste with a quite strong orange aroma. I liked it. The bottle is is also quite nice. Also a good value. Presentation and marketing 8/10, rum quality 5/10. This one got buried in cocktails. Toto je taka klasika, ktoru kazdy pozna. Je t9 rum vhodny na kazdodenne pitie. 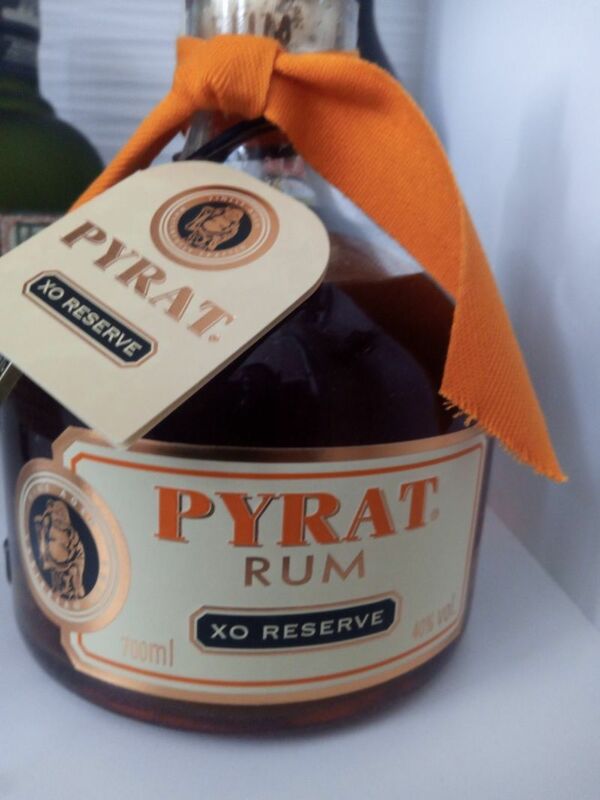 My go to rum for all occasions, long lasting orange floral notes on the palate. Most of the reviews I've read on here explain this rum as overly strong on the alcohol taste. However, that was not my experience at all. The nose on this rum is quite nice; a subtle hint of vanilla and sugar with an overwhelming scent of orange. As per the reviews, I was going to let it sit in the glass for a little while before sipping, but the smell was too good to wait. Upon my first sip I was hit immediately with a pungent orange flavor, but to be honest it tasted quite artificial, almost like orange flavored cough syrup. That was really what stuck with me after a few sips, which made it hard to pick out other flavors. After about half my glass, the rum was too sweet for me to continue drinking straight. So, I splashed a bit of Coke in my glass and it was immediately much better on the pallet. Obviously, mixing any spirit with any other substance reduces its original flavor, but due to the pungent orange flavor of this rum, it balanced out perfectly. This is a very good mixing rum, just don't mix in too much coke, it should be a "Rum with coke" not the other way around. Veľmi pekná fľaša je silnou motiváciou na ochutnanie. Samotný rum však nie je veľmi výnimočný. Plusom je, že sa dobre pije (nemá silný alkoholový štart a ani dojazd). Tým, že nie je príliš sladký, verím, že by z neho nebolela hlava, ani po celovečernom pití. Smell: Intense aroma of orange and grapefruit, brown sugar and fruity notes. Taste: sweet, marmelade ,orange and honey. Nice sipping rum good on ice. Good fruity tones. No strong after taste.